Blue medium strength liquid lock washer for parts up to 1/2" diameter. Prevents threaded fasteners, nuts, bolts, and screws from loosening due to vibrations. Protects from corrosion and is removable with hand tools. Resists temperatures from -54C to 150C (-65F to 300F). 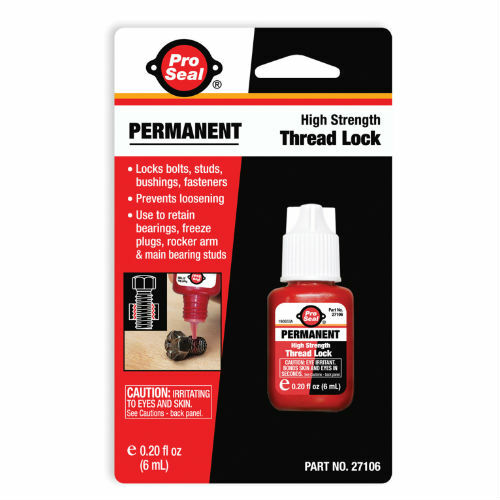 Red high strength liquid adhesive/sealant. Locks bolts, studs, bushings and fasteners up to 1" in diameter. Use to retain bearing, frost plugs, rocker arm and main bearings. Replaces set screws. Resists temperatures from -54C to 150C (-65F to 300F).